This will replay your commits on top of the latest xarray git master. If this leads to merge conflicts, you must resolve these before submitting your pull request. If you have uncommitted changes, you will need to git stash them prior to updating. This will effectively store your changes and they can be reapplied after updating. Then you can find the HTML output in the folder xarray/doc/_build/html/. Please try to maintain backward compatibility. xarray has growing number of users with lots of existing code, so don’t break it if at all possible. If you think breakage is required, clearly state why as part of the pull request. Also, be careful when changing method signatures and add deprecation warnings where needed. Also, add the deprecated sphinx directive to the deprecated functions or methods. 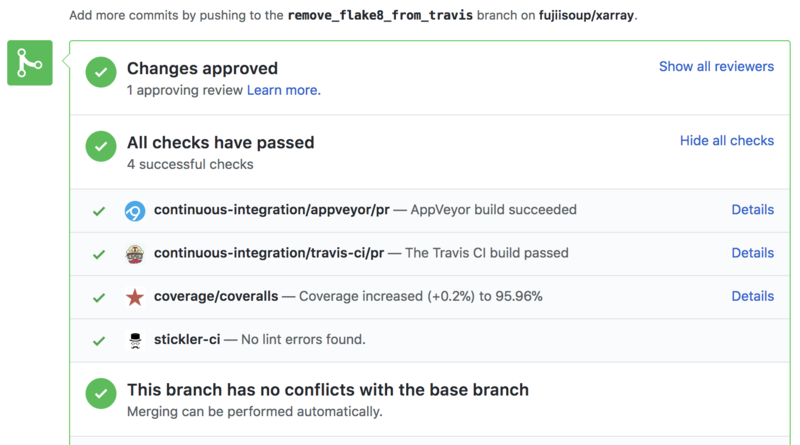 Each time you push to your PR branch, a new run of the tests will be triggered on the CI. Appveyor will auto-cancel any non-currently-running tests for that same pull-request. You can also enable the auto-cancel feature for Travis-CI here. Changes should be reflected in the release notes located in doc/whats-new.rst. This file contains an ongoing change log for each release. Add an entry to this file to document your fix, enhancement or (unavoidable) breaking change. Make sure to include the GitHub issue number when adding your entry (using :issue:`1234`, where 1234 is the issue/pull request number). A subject line with < 72 chars. Please reference the relevant GitHub issues in your commit message using GH1234 or #1234. Either style is fine, but the former is generally preferred.